Marcus Bai (born 11 October 1972) is a Papua New Guinean former rugby league footballer of the 1990s and 2000s. Primarily a winger, he played his final season in 2006 for English Super League team Bradford Bulls. He is the only man to win the World Club Challenge with three different clubs. He retired from the game and currently runs family business. Adrian Lam (born 25 August 1970 in Rabaul, Papua New Guinea) is an Australian rugby league football coach and former international player. He is the head coach of the under 20 St George Dragons squad National Rugby League (NRL) team he signed with them in 2010 and will combine with coaching legend Wayne Bennett.He is a former Papua New Guinea rugby league football player. Lam moved from Papua New Guinea to Brisbane in the Australian state of Queensland at the age of 7 where he was raised. Lam played for Sydney Roosters in the NRL and also for the Queensland Maroons. 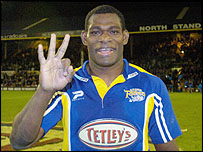 Lam captained Papua New Guinea in many occasion before retiring from Rugby League. He is currently the coach of Papua New Guinea. Stanley Gene (born 11 May 1974 in Goroka) is a former Papua New Guinean rugby league player who currently coaches the academy team at Hull Kingston Rovers. Stanley also plays for Beverley Rugby Union Club. He recently played forHalifax in the Co-operative Championship. He has also previously played for Hull KR, Huddersfield Giants and Bradford Bulls. He is a versatile player, with the ability to cover virtually any position on the pitch. He was a regular for the PNG for over 15 years, and captained the side on many occasions. He is highly regarded almost universally in the UK and Australia and his home country as a rugby league legend and is one of the most highly regarded players in the game. Stanley Gene's representative career lasted over a decade. 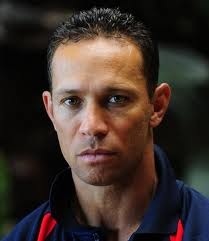 He made his name for PNG in the 1995 Rugby League World Cup, and also played in the 2000 and 2008 tournaments. In addition, he represented his country in numerous test matches before announcing his intention to retire from international rugby league following the 2008 World Cup. Following PNG's exit from the tournament, he was tearfully carried from the field by his team mates and given a standing ovation by the crowd. He is regarded in Papua New Guinea as a sporting legend. 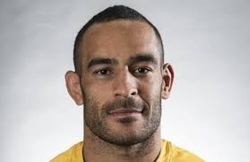 With many badges of honour to his name, Paul Aiton is undoubtedly one of the greats of the game but his genuine humility and down-to-earth approach often masks his accolades. Aiton’s life experience makes him one of the most interesting figures in rugby league and a role model for those who face adversity and overcome obstacles to reach success. Aiton was born in Mount Hagen in Papua New Guinea and at just 6 years old he and his family made the big move to Queensland so that his father could be treated for tuberculosis. Without a word of English in his vocabulary the transition was a challenge for Aiton, but as with most things in his life, Aiton took the circumstances on head first. Football was were he found his niche. In 2003 Aiton signed with Penrith Panthers and in 2004 with just a year of professional rugby league under his belt we was selected to play for Papua New Guinea against Australia. Playing for his country of origin is one of the proudest moments in Aiton’s life. But this wasn’t to be the first time he would represent in the Papua New Guinea jersey. Aiton was made captain of the National side for the 2012 Four Nations tournament. Aiton made the switch to Cronulla-Southerland Sharks in 2010 and remained there as a star of the club for two seasons. In 2012 he set his sights abroad for a new venture and a new challenge and subsequently moved to England to play for the Trinity Wildcats. Beyond the fied Paul juggles a busy life. He is a super star in Papua New Guinea not only for his skills with the football but for his social conscience. Aiton has an unfaltering commitment to improving Papua New Guinea and providing pathways to great achievements for young children in his homeland. In 2007 he completed the Kododa Trail as part of White Ribbon day which raises money and awareness of violence against women. He also supports AusAID in their efforts to educate Papua New Guineans on healthy life choices and protection against HIV AIDS. Paul Aiton is one of Papua New Guinea’s greatest ambassadors and is a wonderful testament to what can be achieved even in the face of significant adversity and hardship. Adrian Lam (born 25 August 1970 in Rabaul, Papua New Guinea) is an Australian rugby league football coach and former international player. He is the head coach of the under 20 St George Dragons squad National Rugby League (NRL) team he signed with them in 2010 and will combine with coaching legend Wayne Bennett.He is a former Papua New Guinea rugby league football player. Lam moved from Papua New Guinea to Brisbane in the Australian state of Queensland at the age of 7 where he was raised. Previous he played with Melbourne Storm in Australia before moving to UK. We thank all the players who took pride to wear the black and gold jersey to represent Papua New Guinea. This website is designed to remember you and bring back old memories back.